Domestic coal-fired power plants are set to shut down at double the rate of last year. The retirements would remove about 6 percent of all coal-generated capacity in the U.S. This comes despite the Trump administration's promise to extend a lifeline to the coal industry. The utilities that coal once relied on have wandering eyes. Natural gas and renewable energy are increasingly competitive and efficient resources. S & P Global Market Intelligence calculated the impending capacity retirement. Coal reporter and co-author Taylor Kuykendall said the downward trend is clear. "In the meantime, these power plants that are already existing are only getting older; they're only gonna get less efficient, and they're only going to get closer to retirement age. None of these plants are gonna suddenly become brand new coal plants," he said. Kuykendall wrote it's clear utilities see a benefit to moving away from coal. "Whether because of climate risk or some other concern about coal, they're not seeing those customers or investors wanting to be involved in the new coal plants or even keeping older coal plants around anymore," Kuykendall said. Ashleigh Cotting, a commodites data journalist a S & P Global Market Intelligence and co-author of the same report said, "in our analysis, we found that the retirement slated for 2019 through 2024, only represented about 9 percent of operating coal capacity." That's an additional 9 percent. The Trump Administration has worked to protect the coal industry with regulation repeals and an attempt to keep struggling plants online. Exports have kept the coal market going, according to Kuykendall. 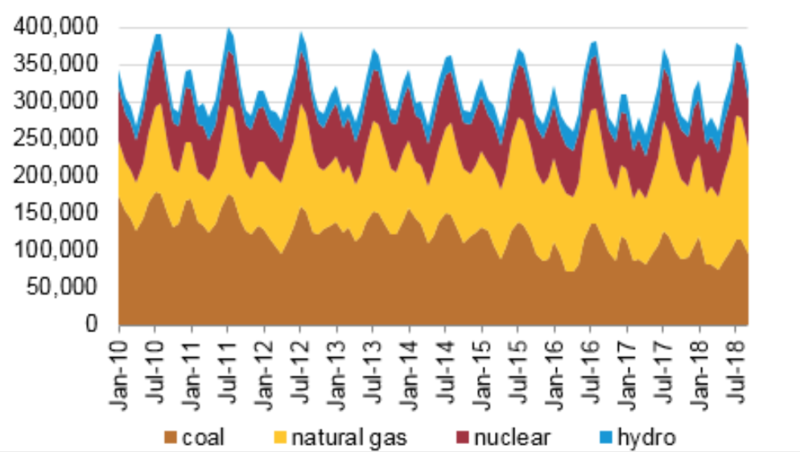 It's worth noting there's still a lot of coal capacity in the country. Of 245.6 gigawatts of power, 14.3 are scheduled to come offline. Still, that's the highest level since 2015. The majority of states have recovered labor forces since the end of the Great Recession, but Wyoming has actually seen the steepest drop in the country. Carbon capture and storage (CCS) technology has been a source of hope for coal country and touted by the Trump Administration as a way to keep the coal industry alive, while reducing its emissions. CCS aims to remove carbon dioxide from significant fossil-fuel emitting sites like power plants – it then either be stored or eventually used to develop products. But one report questions if its development is too slow to have a mainstream impact. A Potential Company Sale, Exec Bonuses, Cut Benefits: What's Going On With Cloud Peak? Cloud Peak Energy has announced it will review "strategic alternatives". Basically, that means the coal producer is open to major changes, including a potential sale of the company in order to improve its financial situation. The move was announced alongside bonuses to executives encouraging them to stay on.